Once you have discovered that you have termites eating away on your Arrowhead home, you need to find a suitable solution-quickly! Varsity Termite and Pest Control has the experience and the expertise to not only spot termites in your home, but to combat them as well. Maybe you are thinking, why is it such a big deal that I have termites? Fact is that those little wood eaters are responsible for billions of dollars in damages to homes all over the U.S. While they probably won’t bite you, they will take a nice bite out of the wooden components of your home. And every home has something that is made from wood, thus offering the perfect menu. To minimize damage and expense, you should work with an Arrowhead termite control professional as soon as you discover that a swarm has found its way inside your home. The threat to your home is real. Lenders often insist on a termite inspection report before closing a deal on a homesale. To ensure that your bugs are taken care of correctly and safely, it is essential that you work with a Paradise Valley pest control professional who is licensed and experienced in the services he or she is offering. Varsity’s termite exterminators are all Termidor certified and know exactly what they are doing when trying to rid your home of pests. You don’t just want anybody to come into your home and spray around chemicals. If you want the job done right, call Varsity. If you see any of these warning signs, contact the Arizona termite extermination professionals at Varsity Termite and Pest Control. Call now and speak to one of our experienced termite control and prevention representatives, receive a free and friendly quote, and schedule your free in-home inspection. Our highly-experienced Arizona termite exterminators will identify the species of termite as well as the severity of the infestation, provide you with a comprehensive report and detailed action plan to exterminate termites from your home, and deliver top-rated and efficient termite extermination services so you can have peace of mind. We use the Sentricon Termite Colony Elimination System to effecitvely eradicate all subterranean termites from your property, giving you quality, thorough termite elimination in Arrowhead. Having your North PHoenix home or business inspected for termites is always a smart move. Termites are silent predators that feed on your house without you noticing. 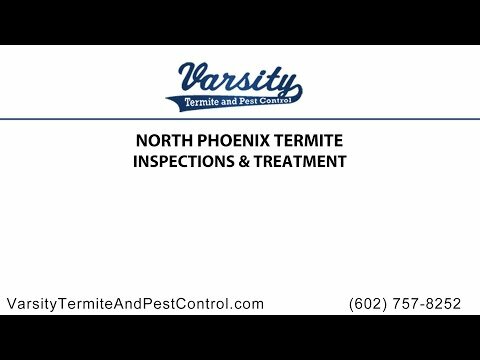 Varsity Termite and Pest Control offers free North Phoenix home inspections for many pests, including termites, and if we detect that bugs have invaded your home, we can help you with effective and affordable termite treatment solutions. Protect your home from the disastrous damage these pests can bring with them by contacting your trusted North Phoenix termite extermination professionals. You can reach us at 602-560-6021 or visit us online at varsitytermiteandpestcontrol.com. When your home is infested with termites, there are a few precautions you can take to protect your home from further damage. Most notably, don’t stack wood against your home. It’s also important to fix rotting wooden components as soon as possible to prevent termite population growth. Finally, keep your yard clean and take care of any damp areas as they are favored by subterranean termites. Varsity Termite and Pest Control is the #1 rated termite control company in Arrowhead and has been providing the best Arrowhead termite prevention and 85338 termite extermination services since 2010. When you are in need of top-rated termite control services in Arrowhead, Arizona, trust the pros at Varsity Termite and Pest Control, the Arrowhead termite company with the most five-star customer reviews. Home termite infestations are costly for homeowners, landlords, and rental property managers. Our professional termite technicians offer affordable termite extermination services in Arrowhead, AZ 85310. Think your home or rental property may have a termite problem? When searching for a termite extermination company in Arrowhead, it is important to read certified homeowners reviews before hiring an Arrowhead termite control company. Varsity Termite and Pest Control is the top-rated Arrowhead termite company on Yelp, the Better Business Bureau, Google Maps, and HomeAdvisor. We pride ourselves on 100% customer satisfaction and offer special offers and coupons to homeowners in Arrowhead, Arizona. Contact our team of licensed termite removal experts today to schedule your free in-home Arrowhead termite inspection. I Have Been Using Varsity For Years! Can I try to get rid off them on my own? While you can certainly try, we advise against it. Getting rid of a swarm of Arrowhead termites is an involved and complicated process that requires not only certain chemicals, but specialty tools as well. Plus we are trained to gain access to areas of your home that you simply can’t or never even have thought of. If you want to get rid of common pests fast and safely, you can count on Varsity’s licensed and versed pest control technicians to get the job done right. From the initial Arrowhead free home termite inspection to the development of a pest maintenance plan, we are here for you. Our approach to pest control works, which is why we warrantee our services’ effectiveness. No matter if you are dealing with termites, roaches, scorpions or other pests, we can help. Looking for experienced termite control companies near you? Varsity Termite and Pest Control is the top-rated termite exterminator in your Arrowhead neighborhood. Need a licensed termite control company nearby your home? Varsity Termite and Pest Control is the best rated termite extermination company in the Arrowhead community. Get the top-rated and effective AZ termite control services you deserve. Varsity Termite and Pest Control in Arrowhead provides the best local termite prevention services. Contact us today to learn more about our comprehensive and effective pest control services and to schedule your complimentary Arrowhead termite home inspection. ✓ Our Clients Love Us!